Caterpillar: Buy, Sell, or Hold? The assumptions behind a prominent bearish case for the stock may need reexamination. Cyclical stocks like Caterpillar (NYSE:CAT) are always subject to debate as to when and where the peak will occur in their earnings, and right now it's all the investment community seems to be focusing on. The company's recent second-quarter earnings were strong, and management was moved to increase full-year adjusted profit per share by 7% at the midpoint of guidance. However, some analysts responded by downgrading their recommendations and price targets. What's going on, and what should investors make of it? The Caterpillar bears are concerned that the company has passed, or is about to pass, peak cycle earnings. This is always a concern with cyclical companies because earnings at peak will be far higher than at the trough. Paradoxically, this means a cyclical company usually trades at a low price-to-earnings ratio at the peak and high P/E at the trough. In other words, Caterpillar's forward P/E of less than 12 is a value trap if the company' earnings are set to peak. 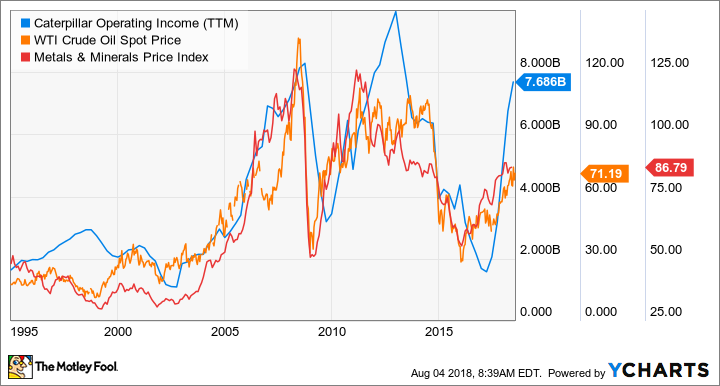 Such thinking was encapsulated by a question from Jefferies analyst Stephen Volkmann on the earnings call: "[T]he market is worried about where the industrial cycle is, and whether things may be kind of midcycle or above. And I'm curious if you have an opinion as to sort of where we are overall with Cat cycles." Data source: Caterpillar presentations. Chart by author. Throw in concerns over the potential impact of tariffs on major industrial companies like Caterpillar, and it's tempting to conclude that selling the stock makes good sense. First, director of investor relations Amy Campbell pointed out that Caterpillar's Europe, Africa, and Middle East (EAME) sales are "well below sales levels a decade ago." In addition, while North America sales are currently very strong, they come after "years of below-trend sales." In other words, the rate of growth of sales might have peaked, but that doesn't mean sales growth won't remain positive so earnings can continue to grow. To flesh out what Campbell is saying, consider oil-production capital spending, relevant to Caterpillar's energy and construction equipment: It peaked at $519 billion in 2014, then slumped as oil prices fell in 2014. Analyst projections are for spending to increase from $246 billion in 2017 to $299 billion in 2018 -- a far cry from levels in 2014. Second, Caterpillar's key markets are driven by things like metals and mineral prices (in the resources industries segment), and the price of oil, as much as they are by the construction cycle. If these commodity prices go up, then capital spending by their producers (Caterpillar's customers) are likely going up. So unless you have a strong view that mining commodities and oil are going down, it doesn't make sense to conclude that Caterpillar's end markets are about to peak. CAT Operating Income (TTM) data by YCharts. Putting all this together, it seems clear that assuming Caterpillar is about to hit peak earnings is actually assuming both that energy and mining commodity prices are coming down in the next year or so, and that the global construction cycle is in late innings. These may or may not be the case. But unless you feel strongly that they are, the company's forward P/E of just less than 12 isn't going to stop you from buying or holding the stock. All told, Caterpillar is only expensive if energy and mining commodity prices are coming down.